I’m a huge fan of Mythbusters and I’m eagerly awaiting every new episode of their show. In case you don’t know what Mythbusters is (which I don’t think is very likely…) – it’s a show where assumptions and popular beliefs are tried and tested to see if they hold true or they’re one of so many misconceptions the human kind has amassed over time. For instance, in one of the episodes they’re testing an English idiom “a bull in a china shop” to see how the situation pans out in real life. This particular myth was actually busted because the bulls kept avoiding the shelves in a makeshift china shop even when running around at high speed thus proving that the proverb “a bull in a china shop” is just something people believe but wouldn’t prove right were it to happen for real! Here’s a list of most Mythbusters myths and I bet you’ll find most of them interesting and even fascinating! And, if you haven’t watched the Mythbusters show on Discovery TV yet, I warmly suggest you start doing it! Especially considering how fast your spoken English is going to improve if you keep watching it over a longer period of time! Why? Well, read the rest of this blog post and you’ll find it out! The English language used by Jamie, Adam, Tory, Grant and Kari – they’re the Mythbusters testing the myths – is quite simple for the average foreign English speaker to understand, and you can watch the episodes even with not so huge English vocabulary in store. Yes, technical terms are used quite often in the show, yet when you watch the Mythbusters in action it’s always obvious what they refer to and it’s actually a great way of building your English vocabulary. So, for instance, if you find it slightly difficult to watch movies in English without subtitles, you’ll definitely have by far less problems understanding the language used in this entertaining program. And what makes it ideal for improving your spoken English is the fact that when you start understanding nearly everything they’re talking about, you can repeat phrases and idiomatic expressions used in the show as you’re watching it thus adding them onto your active English vocabulary. In so many ways Jamie and Adam are just like any other guy you may run into on the street when it comes to using plenty of figurative language, and that’s exactly what you need in order to improve your conversational English! Why? Well, it’s because they use plenty of idiomatic expressions when conducting tests, blowing up stuff and making jokes about each other, and that’s something that makes a big difference when it comes to English fluency. In ordinary, daily conversations idiomatic expressions play a huge role, and even knowing a handful of them you can get by in many different situations when you might be looking for the right words to explain a certain thing. I, for instance, remember hearing a sentence – “Let’s see how it stacks up!” – in the episode about the bubble bike and it was quite obvious what it meant. They had created the best possible aerodynamically shaped frame around a bike and wanted to compare its gas emissions with a normal bike. So quite obviously ‘to stack up against something’ means to compare it with something; it sounds friendlier and it’s something definitely worth memorizing. I jotted the phrase down in my pocket dictionary for later repetition, and now I can produce it instantly when a similar occasion arises! Another idiom I learnt from Jamie is “up the ante” which he uses when it’s time to take the testing to the next level. It was quite obvious what it meant from the context alone, and I don’t think you’ll have to use any dictionaries to figure out the meanings of the various idiomatic expressions used by Mythbusters. I’ve mentioned this on my blog many a time – phrasal verbs along idiomatic expressions make up a significant part of spoken English and it’s also much easier to speak if you use phrasal verbs instead of their formal counterparts. “Crank up the volume!”; “Let’s step it up a gear”; “I think we should scale it up” are just a few of the phrasal verbs I’ve learnt while watching Mythbusters and I have to tell you that they’ve come in handy countless times in my English conversations at work. Don’t forget that Mythbusters is all about practical things which we all have to do either at home or work therefore the phrasal verbs you’ll learn from the show are invaluable for your active English vocabulary! And again – don’t forget to jot them down within a context because you’ll definitely want to repeat that phrase a few times before it settles into your memory. All Mythbusters are Americans and you must have definitely noticed that your average American speaks quite slowly and pronounces words clearly enabling you to understand exactly what they say 99% of the time. It’s important for three reasons. First – you wouldn’t enjoy the Mythbusters show if you couldn’t make out what they’re saying half of the time. Unlike listening to music or watching action movies, you have to be quite focused on what’s going on in the show at any given time. Their tests are often of a technical nature and amidst all the bomb blasts, car racing and smashing things together at high speeds you really want to make sure you follow what they’re doing. Second – it’s great for building your English listening skills .Even if you don’t notice considerable short-time changes, your fluency trend is actually going up as you engage in all types of English-related activities. Today it is Mythbusters, in a year or two it might be some other program or TV series you’ll be able to enjoy just because you built your listening and understanding skills while watching Mythbusters. And lastly, their clear pronunciation enables you to write down any new idioms, phrasal verbs and technical terms in a notebook so that you can memorize them for using in your own English conversations. From flying planes to shooting machine guns, from stuffing a cement truck with so much explosives that it simply annihilated it to smashing a glass using nothing else but a high-pitched voice – it’s really hard to think of something that the Mythbusters might have left out since the show started back in 2003! I’m pretty sure that no matter it is that you do at work and in your free time, you’ll definitely acquire significant relevant vocabulary if you watch Mythbusters on a regular basis. And if you’re anything like me, you’ll simply enjoy the ability to speak about a wide range of topics and use specific terms to tell your story. “The shock wave propagates at a speed of 5 K per second.” (Technical term describing movement of a shock wave after an explosion). “Now it’s time to crunch the numbers.” (A typical English collocation meaning to sum up figures). “Let’s rig up the frame first and then we can see how much more timber we need.” (A very practical phrasal verb meaning to set up, to erect, to build something). Personally I’ve learnt all these and a whole lot more new English words thanks to the Mythbusters show and it has enabled me to talk about technical matters more fluently. And let me say it to you one more time – you should most definitely learn all new vocabulary as part of context in order to create associations between the new words and your existing English vocabulary! 6. Mythbusters is Simply Too Good To Be Missed! Do you think I’m watching Mythbusters with the sole purpose of improving my spoken English? Do you think I’m constantly writing something in my pocket dictionary with shaky hands just so that I wouldn’t miss another new phrase or expression? Of course I don’t! And the purpose of this article wasn’t to convince you of the need to focus solely on the language side of the show. You have to ENJOY LIFE THROUGH THE ENGLISH LANGUAGE, all the English learning and improving comes with it – that’s the point I’m trying to make here! Mythbusters are great fun, and the two teams – Adam and Jamie and Grant, Tory and Kari are constantly making jokes, mocking each other (Adam always makes jokes about Jamie’s moustache!) and having a good time while experimenting with electricity, high explosives and crashing cars. On top of everything else I said about Mythbusters in terms of relevancy for your spoken English improvement, we may add another important factor – they’ll teach you how to have fun while being around other English speakers. And if you think about it, it’s very important for the moments when you might feel a bit down because of re-occurring English fluency issues, for instance. They’ll cheer you up, and you’ll find it much easier to forget yourself while watching their show which is going to help you ignore the bad emotions within. 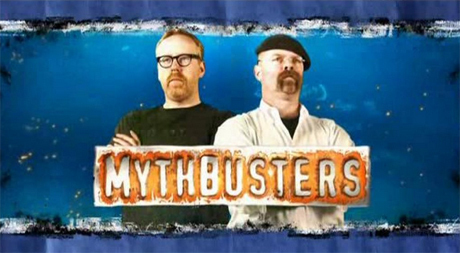 Can Mythbusters help foreign English speaker to improve their spoken English? Great article. It’s important to be exposed to a variety of input (movies, shows, documentaries, etc.) and, if that input is interesting or fun, you’re more likely to learn more.nnBy the way, people say “having said that”, not “having said this”.